Angie's mother, two sisters and a nephew have been visiting with us for a couple of weeks. We've been having a grand time showing them around, and trying to help them get over the jet lag. Fabian is making pictures better and faster than I can. 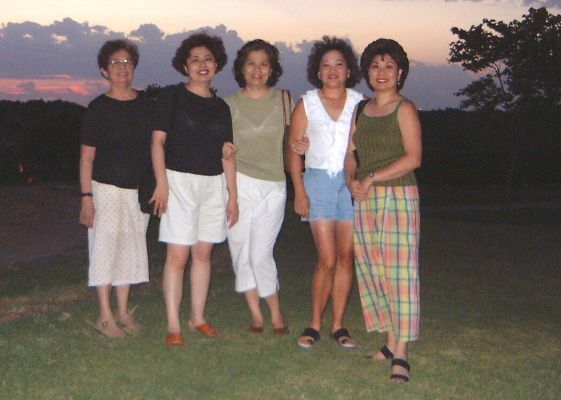 He took this one using a tripod and self timer on the camera. Just before the family arrived, I managed to complete the installation of a small ethernet network throughout part of the house. 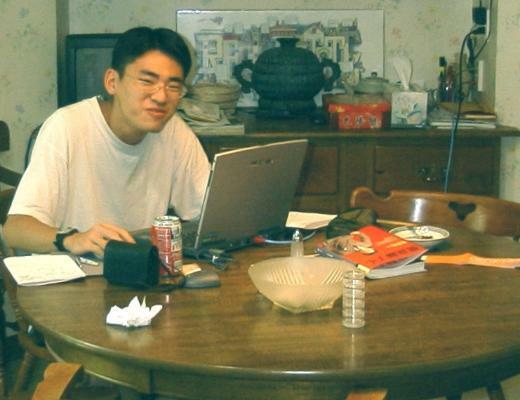 As a result, Fabian was able to plug in his Acer Notebook computer and have an immediate broadband internet connection. I teased him that the only thing he did in Texas was eat, sleep, and compute! Fabian takes even more pictures than I, and was busy posting them on his Taiwan web site. Now that he's out of college and in the military, he probably doesn't have time for that anymore! 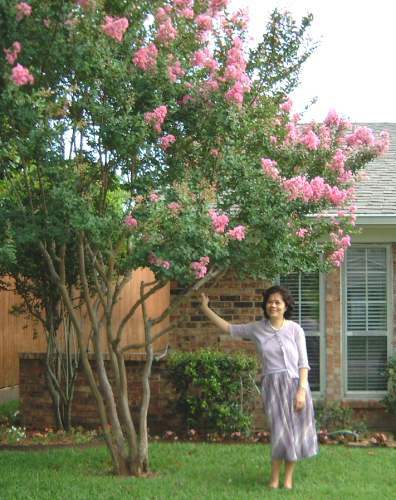 Angie's sister, Ai Yueh, fell in love with the crepe myrtles in the Dallas area. I guess we just take them for granted. My backyard hammock was a hit, particularly early in the morning. Everybody had jet lag, so most were up, wide awake, in the wee small hours of the morning. Laying in the hammock in the cool of the morning was a pretty relaxing way to start off a vacation. Angie's mother even came to like it, although she had to shoo her daughters off to get to it. 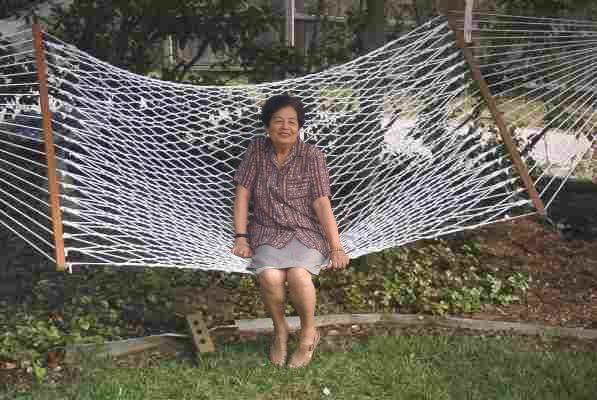 She regularly went for a morning walk down to the local school, and got the hammock when she returned. 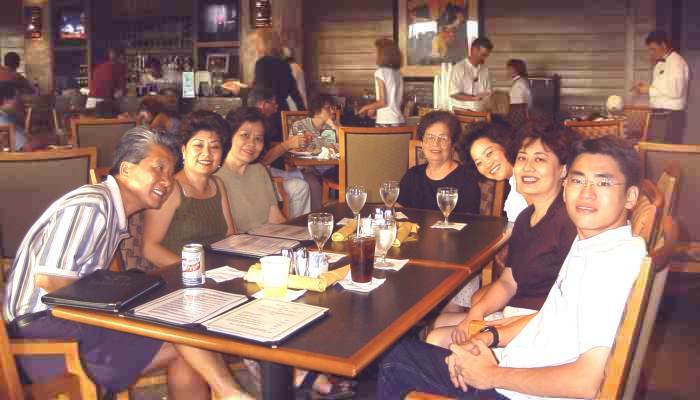 Stanley and Diana Joe invited all of us up to Eldorado country club for dinner. I snapped this show just before we ordered. 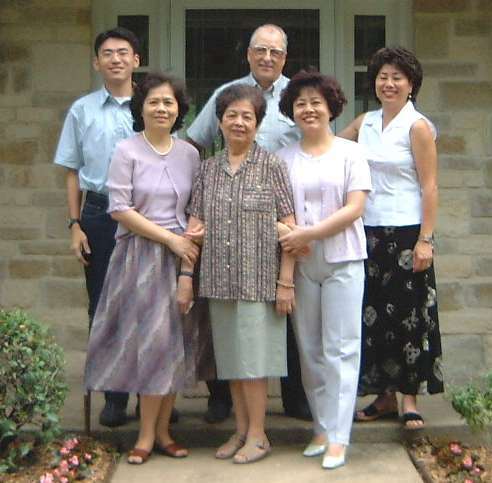 L-R Stanley Joe, Angie, Ai Yueh, Mother Lin, Diana Joe, Li Shun, and Fabian. Fabian got this picture just at sunset at Eldorado. 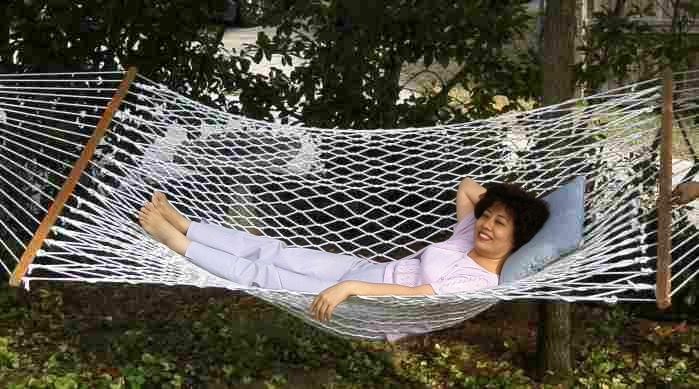 Back home, Li Shun managed to grab the hammock Ahhhh, this is the life! At times I think she and Angie look like twins. This picture looks very much like Angie.